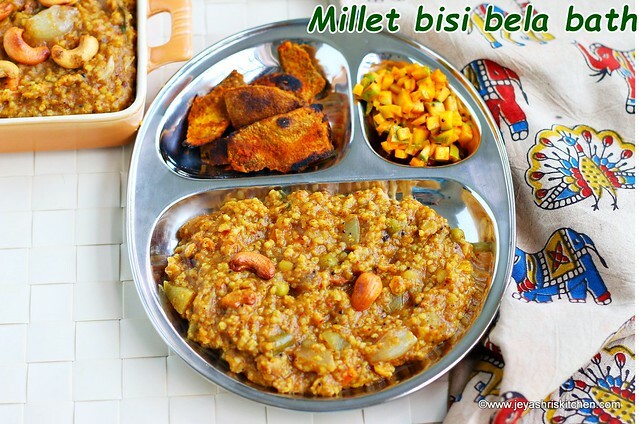 Bisi bele bath, using millets with step by step pictures. Bisi bele bath is a popular Karnataka dish, made usingMillets and toor dal and other freshly ground Sambar masala. I have already posted my version of Bisi bele bath recipe with video, but i don't claim it as authentic Karnataka recipe. This Millet Bisi bele bath recipe i have already given in my First cook book on Millets, Neengalum Samaikalam Sirudhaniyam. 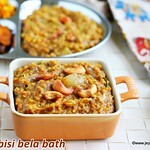 Recently i tried a slightly different version of bisi bele bath, which i learnt from my co sister. I have tried this some time back using rice and shared in Jeyashris kitchen Instagram too. I generally use home made sambar powder and fresh spices for making bisi bele bath, but she always uses only fresh masala. I generally don't add cinnamom or clove in Bisi bele bath as my family don't like it that way. Kids love this version too, but today when i made this recipe by replacing millets with rice, i was not sure as how they will respond. They enjoyed the Millet Bisi bele bath and we had Yam Tawa fry and cut mango pickle to pair with this hot hot bisi bela bath | sambar rice. Bisi bele bath,a popular recipe of Karnataka,made using Millets and freshly ground sambar powder. *I used carrot, peas, beans and chow chow. ** I used Varagu| kodo millet, you can use any Millet of your choice. Wash and cook the millet and dal. Add 1/4 tsp of turmeric powder and a pinch of asafoetida and add 2.5 cups of water to this. Cook this in a pressure cooker for 5-6 whistles. Peel the skin of onions and cut the veggies into cubes. Soak the tamarind in hot water and extract 2 cups of tamarind water. In a pan add 1 tsp of oil and roast the dhaniya,channa dal,venthayam and red chili till golden brown. Once it is roasted 3/4 th add the coconut to this. I used kopra,if using fresh coconut saute till it changes to golden brown colour. Allow this to cool completely and grind into a fine powder. Fresh sambar masala is ready. In a cooker,add sesame oil and ghee. Add the mustard seeds to this. Once it crackles add the small onions. Saute till becomes slightly brown and translucent. Add the veggies to this. Add the tamarind water to this now. Add 1/2 tsp turmeric powder,salt and a pinch of asafoetida. Now add the freshly ground sambar powder, reserving 1 tblsp aside for later use. Keep the flame low while adding the fresh sambar powder, else it may form lumps. When it starts boiling add the cooked millet toor dal mixture. Close the cooker and cook for 1 whistle and keep in a lowest flame possible for 5 minutes. Once the pressure is released automatically, open the cooker and mix well. Add the curry leaves. Roast the cashew nuts in ghee and add it to the bisi bele bath. In 1 tsp of ghee or oil add the reserved 1 tblsp of freshly ground sambar masala, saute for few seconds and immediately transfer it to the bisi bele bath. Mix well. 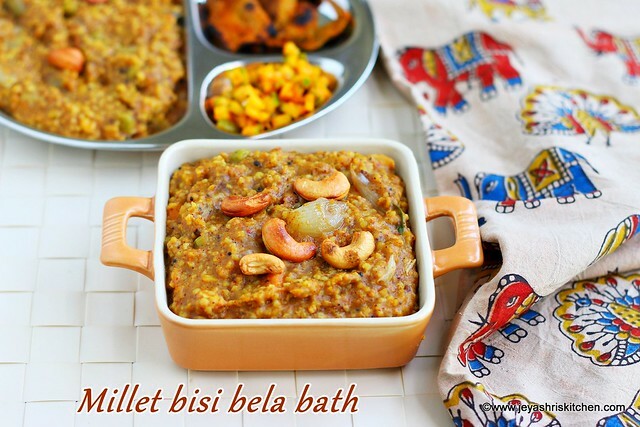 This gives a very fresh and wonderful aroma to the millet bisi bela bath. Mix well and serve hot with any side dish of your choice. A simple papad will also taste yum. Cook this in pressure cooker for 5-6 whistles. Once it is roasted 3/4 add the coconut to this. I used kopra,if using fresh coconut saute till it changes to golden brown colour. Once the pressure is released automatically, open the cooker and mix well. Add curry leaves. If you want you can make little extra sambar masala and store in an airtight container for a week. This can be used for potato and brinjal curry. Add 1/2 cup -1 cup of water before closing the cooker to get the right consistency of the bisi bele bath. I used Varagu, you can use any variety of millet like Samai, kuthravali or even samba wheat and quinoa too too. Adding 1 tblsp of fresh masala in the last gives a wonderful aroma to the bisi bele bath.